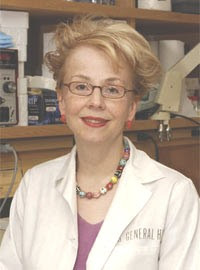 This month, diabetes researcher/immunologist and associate professor at Harvard Medical School, Dr. Denise Faustman's work is profiled in a trade magazine you've likely never encountered before: the American Association for Clinical Chemistry's Clinical Laboratory News, that article may be found at http://www.aacc.org/publications/cln/2012/June/Pages/BCellFunction.aspx. (It helps when your partner is a doctor at a school that teaches labwork!) That's a trade publication geared mainly towards people who work for clinical laboratories (you know, like Quest Diagnostics, LabCorp, hospital labs and others). However, the readership for this publication is diverse, ranging from chemists to phlebotomists, to the people who man the front desks at specimen collections facilities, so it's generally written for the layman. Specifically, the article discusses how Dr. Faustman has developed a far more reliable assay to measure C-Peptide (used to measure endogenous insulin production) than the ones used presently by most labs. The dictionary defines an assay as follows: a quantitative determination of the amount of a given substance in a particular sample, so in this case, how much C-Peptide exists in someone's blood. Dr. Faustman and her colleagues recently used a new, ultrasensitive C-peptide immunoassay to measure serum C-peptide levels in people with long-term type 1 diabetes (Diabetes Care 2012;35:465–70) The assay being used in her clinical trials today is an ultrasensitive assay, which is available commercially in the U.S. as a kit from the manufacturer, Mercodia, which is based in Uppsala, Sweden, but whose U.S. ops are located in Winston-Salem, NC. A number of years ago, when her well-discussed (and sometimes debated) human BCG clinical trials were still in the planning stages, I had the joy of speaking with Dr. Faustman by telephone for over an hour. She stressed the importance of having an appropriate assay or she felt the trials would be pretty meaningless, and indeed, she spent several years developing one. Whether you support her work or not, it's clear she understands the scientific method, and she didn't want the same old inaccurate assays used to measure the success or failure of these trial results, perhaps because she KNEW they wouldn't measure the results precisely enough. My readers should also know that ALL insulin sold via pharmacies or to hospitals in the form of IV bags, regardless of whether that insulin biosynthetic or derived from abbatoir animal pancreas glands, has had any trace of C-Peptide completely removed from it during the HPLC (high-pressure liquid chromatography) purification process. Insulin that we use to treat diabetes comes as the mature protein, not as proinsulin that needs additional processing. There is an entire debate about whether removing it is beneficial or not (the growing consensus seems to be that removing C-Peptide also eliminates something which helps keep tiny blood vessels to remain flexible, therefore removing it also contributes to microvascular complications in people with diabetes that were once blamed exclusively on glycemic control, or lackthereof). Regardless, if you use exogenous insulin of any kind, there's no such thing as C-Peptide in that, so that means a C-Peptide assay measures only the insulin that your body makes on its own, but nothing else. However, the article discusses how the error ratio for standard C-Peptide assays is surprisingly large. In clinical terms, the standard C-peptide assays have lower limits of detection of 15 pmol/L and 33.1 pmol/L, respectively, whereas the ultrasensitive assay Dr. Faustman and colleagues developed has a lower limit of detection of 1.5 pmol/L with inter- and intra-assay coefficients of variation of 5.5 and 3.8% at 37 pmol/L. She also posits as to the various reasons doctors have been so willing to tolerate C-Peptide assays with a level of accuracy that might not be acceptable in say, for example, blood glucose or glycosated hemoglobin results is because there's a sense that the end result doesn't impact how they will ultimately treat patients. In plain English, doctors have really never pushed for greater accuracy in C-Peptide because frankly, they didn't see much reason for anything more accurate. After all, there wasn't a damn thing they could do about it, so what's the point? Dr. Faustman called [it] therapeutic nihilism. She said the thought has been that the pancreas is not functioning after about one-to-two years, so our treatment approach has been kind of fatalistic. 'Oh, your pancreas is dead, we don't have anything to save the remaining pancreas'," she explained. Dr. Faustman is director of immunobiology at Massachusetts General Hospital and an associate professor of medicine at Harvard Medical School in Boston. But doctors and researchers really SHOULD care. Notably, in virtually every clinical trial used for immune system interventions for autoimmune diabetes (type 1), researchers have struggled to enroll newly-diagnosed patients, when millions of other patients who might have been prefectly viable trial participants have been casually dismissed as ineligible. In fact, with better assays, immune system interventions might have a far larger universe of would-be trial participants. Presently, her assay is not yet FDA approved for commercial laboratory use, but a spokesperson for Mercodia indicated that the company may seek additional Food and Drug Administration clearance for the assay as a marker of ß-cell decay, based on findings from this study. Hence, future clinical trials might be able to draw from a significantly larger pool of potential trial participants. Today, potential therapeutic interventions always seem to target those newly-diagnosed, often when patients (and/or their caregivers) are overwhelmed with the news and least-able to consider trial participation. In the article, Dr. Faustman agreed that the findings could reshape diabetes-related research. "The standard C-peptide assay drove every clinical trial protocol in this field for the past 25 years because everybody thought that if were you're going to do an immune intervention trial in type 1 diabetics you had to get the kids within a week, or a month of diagnosis or do very complicated things and try to identify them in populations before they even get a high blood sugar. That's because the drugs being developed weren't stopping the disease, they were slowing the disease. So that meant you had to have C-peptide present to slow the destruction of the pancreas," she explained. "This new assay will open up the field tremendously to say people who have had the disease two to even 40 years shouldn't be rejected from these kinds of trials and we should be doing more clinically for these people." So that's a fresh perspective on Dr. Faustman's contributions. Even if the BCG trials go nowhere, having a more reliable assay available commercially will enable future immune system interventions to be trialled on a much broader audience of people with type 1 diabetes. That could be an even more important contribution, particularly as the field of immune system interventions for a host of different autoimmune diseases emerges in coming years! Also see my posts http://goo.gl/vOAd0 and http://goo.gl/TrkDX for more background. I've always wondered about the C-peptide test. Its been one of the more important markers for evaluating the success in my islet cell transplant. It has followed the normal curve that my transplant has taken, but there have been a few unexplainable ups and downs. It makes me wonder if there are some other variables such as diet that might have short term effects on this test. A better way to assess would be valuable in this kind of research. Thanks for posting this.